People call out to friends jailed inside the Workhouse during a protest against conditions at the jail during a July 2017 heatwave. 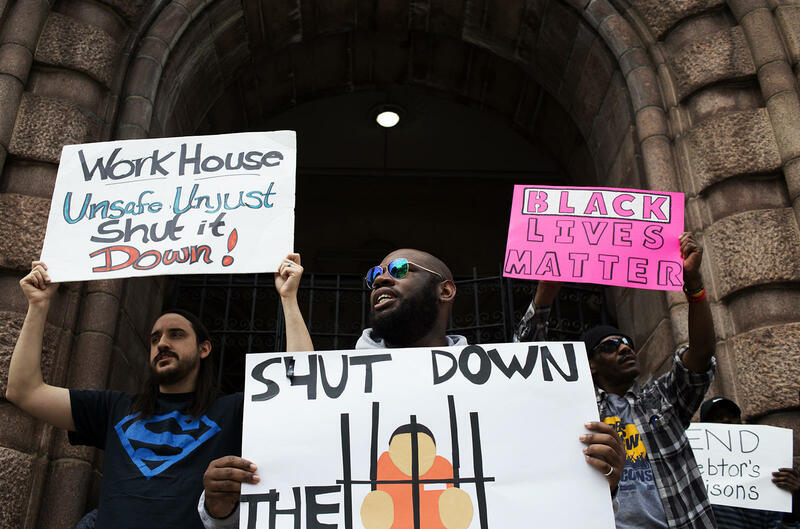 A new campaign calls on city officials to shut down the medium-security jail. Organizers say their goal is to build public and political support to close the city’s medium-security jail, and, in the meantime, enact policies that would reduce the number of people held at the facility. “The very existence of the Workhouse shows me that this city is willing to throw people away,” said Inez Bordeaux, an organizer with the campaign who in 2016 spent a month at the Workhouse. Like many former inmates, Bordeaux described living in the jail with roaches, rats, mold and broken toilets. In November, ArchCity Defenders filed a class-action lawsuit against the city of St. Louis detailing allegations of inhumane living conditions, medical neglect and violence at the Workhouse. The lawsuit came after inmates were heard screaming for help from inside the jail during a brutal summer 2017 heatwave, prompting protests and public scrutiny. In response, the city installed temporary air conditioning units inside the aging facility. “Air conditioning was a legitimate complaint – and that got fixed,” said Public Safety Director Jimmie Edwards, who oversees the city’s jails. Edwards said the corrections department works to stay in compliance with a state statute that requires all prisoners to be treated humanely. “Jail is not going to be very comfortable and I would not expect it to be. I do expect it to be reasonable and humane,” he said. Blake Strode, executive director of ArchCity Defenders, said he’s confident the evidence will support the lawsuit’s claims. But, he said, a lawsuit alone won’t lead to the kind of changes the Close the Workhouse campaign is seeking — an end to cash bail and increased investment in black and low-income communities most affected by racial disparities in policing. “One lawsuit, while important, could not possibly bring about the kind of decarceration and re-imagining of public safety that is desperately needed,” Strode said. That kind of change, he added, requires a community effort and a multi-pronged campaign — one led in part by people who have experienced life inside the Workhouse. To amplify the stories of people formerly held at the jail, ArchCity Defenders has partnered with various activist and advocacy groups including Action STL, Missourians Organizing for Reform and Empowerment and The Bail Project. Darrick Smith, center, spoke at a May 2017 protest outside City Hall. Smith said he experienced human rights violations while incarcerated at the Workhouse in 2006. The vast majority of inmates at the Workhouse are awaiting trial behind bars because they can’t afford bail. In May 2018, more than 98 percent of inmates at the city’s two jails were being held pretrial, according to monthly corrections department reports. Eighty-six percent of people imprisoned in city jails were black, even though St. Louis’ population is about 49 percent black. Not much of what the Close the Workhouse campaign is saying is new. Higgins said that for years, people have shared stories about conditions at the facility. And for years, advocacy groups have tried to call attention to them. What is new, Higgins said, is the coalition of formerly incarcerated people, nonprofit groups, experienced organizers and volunteers working together on an advocacy campaign. Higgins and others involved in the campaign say the local organizing that led to Close the Workhouse began, to a large extent, in the streets of Ferguson after a police officer killed Mike Brown, an unarmed 18-year-old, in 2014. Months of protests and activism there sparked national conversations on race and policing and brought widespread attention to the unequal treatment of black people in the St. Louis region. Four years later, relationships built in Ferguson have laid the groundwork for a new campaign for reform. 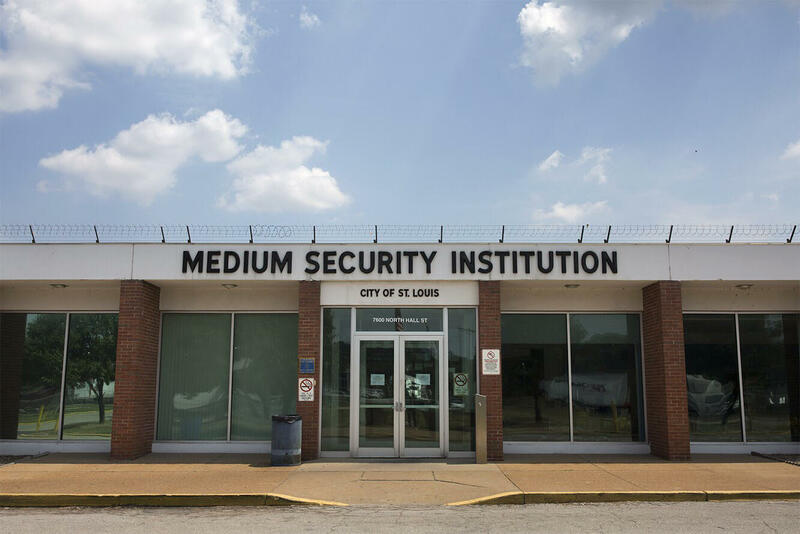 An activist campaign calls on city officials to shut down St. Louis' medium-security jail, commonly known as the Workhouse. On a warm day in April, hours before dozens of St. Louisans crowded into a second-floor event space at 2720 Cherokee St. to raise money for Close the Workhouse, the mayor of Philadelphia announced a plan to close that city’s oldest jail – a facility also plagued by accusations of infrastructure problems and pest infestations. The announcement came after Philadelphia reduced its jail population by 32 percent over three years with the help of policies put in place by a progressive district attorney and a $3.5 million MacArthur grant that allowed the city to explore and develop ways to jail fewer people. “Reforming bail practices and increasing alternatives to detention is a viable and realistic solution that simply requires a little imagination from elected officials,” said Janos Marton, an organizer for Close the Workhouse. “One thing St. Louis can learn from other cities is that the link between jailing people for minor crimes and public safety is a myth,” Marton said. He points to Philadelphia and New York City, where crime rates have continued to drop as the jail population has gone down. With the Workhouse closed, he added, St. Louis would still have a city jail. The City Justice Center downtown has room for 860 people; the Workhouse has capacity for 1,138 people. In May, the average jail population between the two facilities in St. Louis was 1,140. St. Louis officials are already working to develop pre-arrest diversion programs and are considering alternatives to pre-trial detention, according to Carl Filler, senior policy advisor to Mayor Lyda Krewson. Marton said he believes a commitment from city officials to shut down the Workhouse is necessary to create the sense of urgency that drives successful policies and programs. Marton previously worked on a campaign that helped lead to the mayor of New York City pledging in March 2017 to close the infamous Rikers Island jail complex within the next 10 years.